The selection of images below highlights some of the observations and discoveries made during the Gulf of Mexico 2014 expedition. 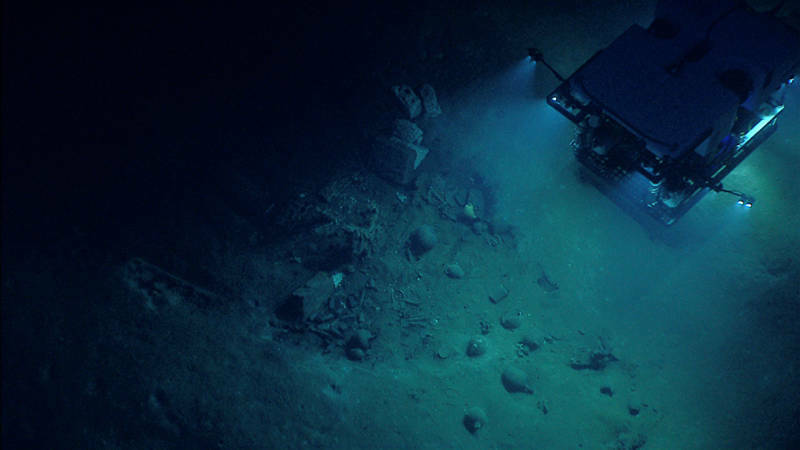 During a dive on sonar anomalies suspected to be a shipwreck, the Deep Discoverer (D2) remotely operated vehicle instead discovered the remnants of asphalt volcanoes, or “tar lilies”. After documenting the first asphalt extrusion, D2 investigated a second sonar anomaly which turned out to be another "tar lily." Image courtesy of the NOAA Office of Ocean Exploration and Research, Exploration of the Gulf of Mexico 2014. Download larger version (jpg, 1.4 MB). 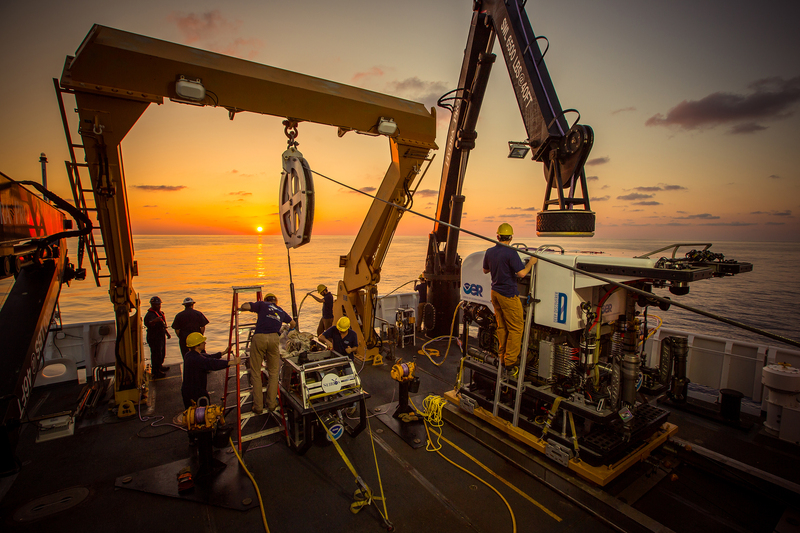 The remotely operated vehicle (ROV) team works on the vehicles following completion of a dive, and readies them for the next day. Image courtesy of NOAA Office of Ocean Exploration and Research; Extended Continental Shelf data courtesy UNH CCOM. Download larger version (jpg, 3.2 MB). A crinoid - potentially a new species in the Family Thalassometridae - clings to a black coral on the West Florida Escarpment. Image courtesy of NOAA Office of Ocean Exploration and Research. Download larger version (jpg, 1.7 MB). 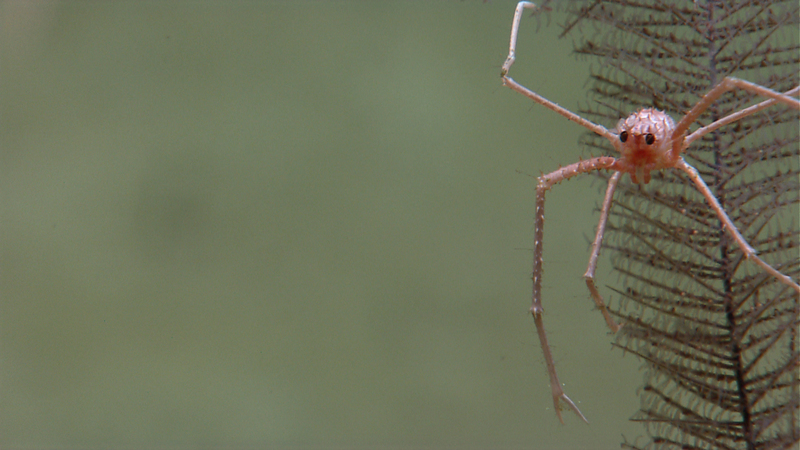 A squat lobster, Gastroptychuscf.spinifer, resides on a black coral. Members of this genus always associate with gorgonian or antipatharian corals, and commonly are observed with their chelipeds (claws) spread. Image courtesy of NOAA Office of Ocean Exploration and Research; Extended Continental Shelf data courtesy UNH CCOM. Download larger version (jpg, 1.1 MB). 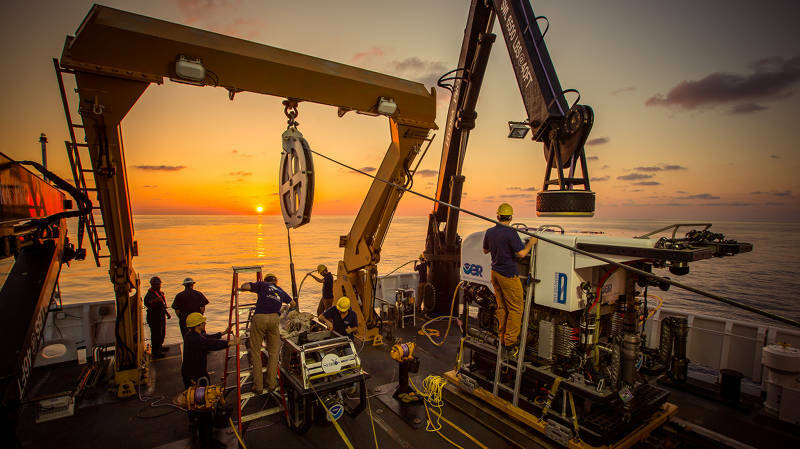 ROV Deep Discoverer is recovered from a dive during the 2014 Gulf of Mexico Expedition. Image courtesy of NOAA Office of Ocean Exploration and Research. Download larger version (jpg, 367 KB). 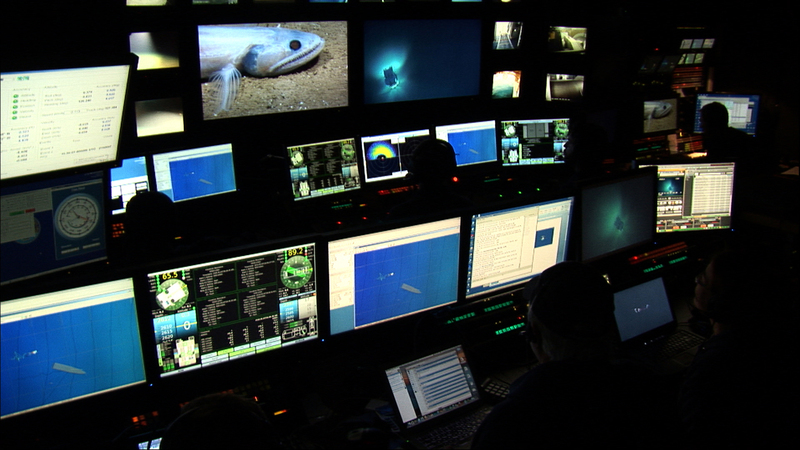 Okeanos Explorer’s control room as seen during an ROV dive. The high-tech, integrated control room is the nerve center for cruise operations. 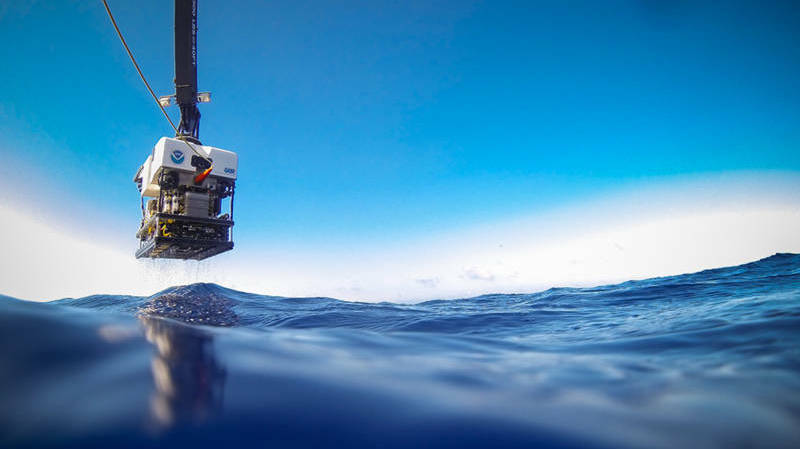 Here, pilots and navigators control the ROV, onboard scientists view the live video feeds from the ROV and interact with scientists on shore, onboard technicians acquire and process mapping and other data, and telepresence operations are run. Image courtesy of NOAA Office of Ocean Exploration and Research; Extended Continental Shelf data courtesy UNH CCOM. Download larger version (jpg, 935 KB). Identified as the biology highlight of the cruise by many of our scientists and viewers alike, this dumbo octopus displayed a body posture that has never before been observed in cirrate octopods. 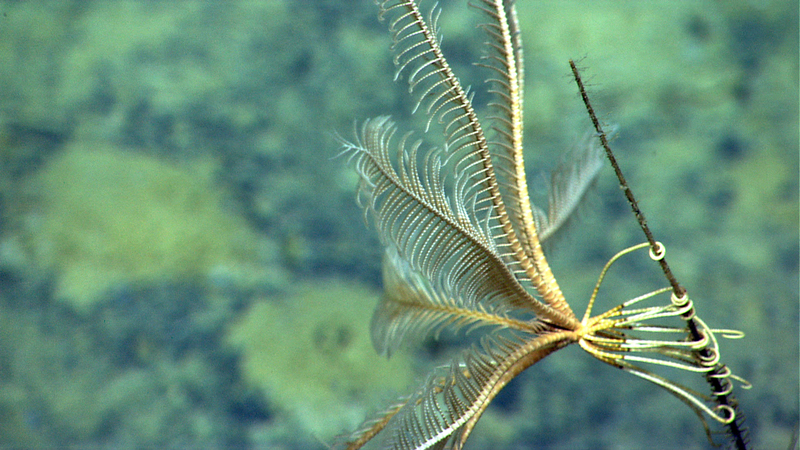 Image courtesy of NOAA Office of Ocean Exploration and Research. Download larger version (jpg, 1.0 MB). 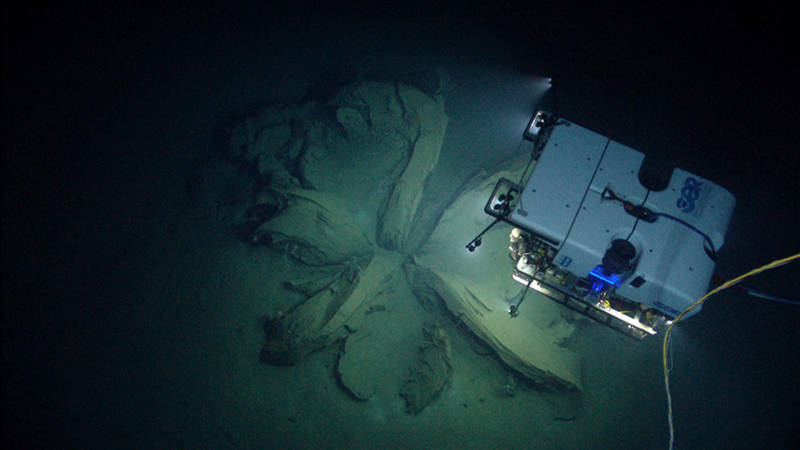 ROV Deep Discoverer (D2) visited three historic shipwrecks during the 2014 Gulf of Mexico Expedition. Here, D2 investigates Monterrey Shipwreck C’s anchor and the associated fauna and artifacts in the area. Image courtesy of NOAA Office of Ocean Exploration and Research; Extended Continental Shelf data courtesy UNH CCOM. Download larger version (jpg, 2.1 MB). 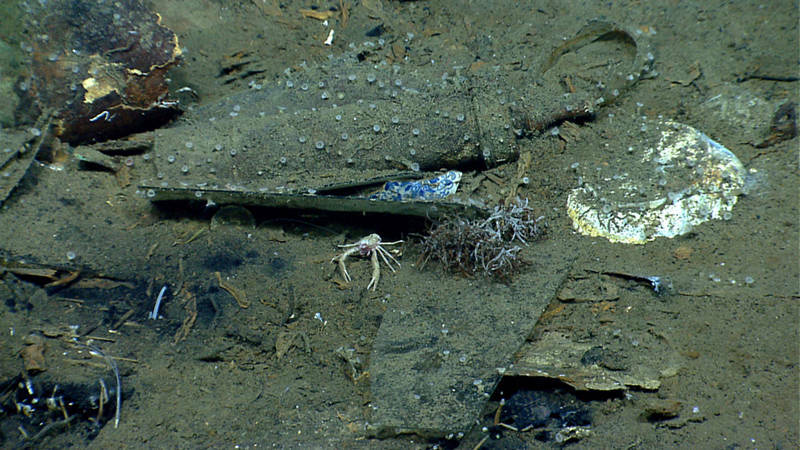 Throughout the 2014 Gulf of Mexico Expedition, sea cucumbers were one of the most abundant species encountered. 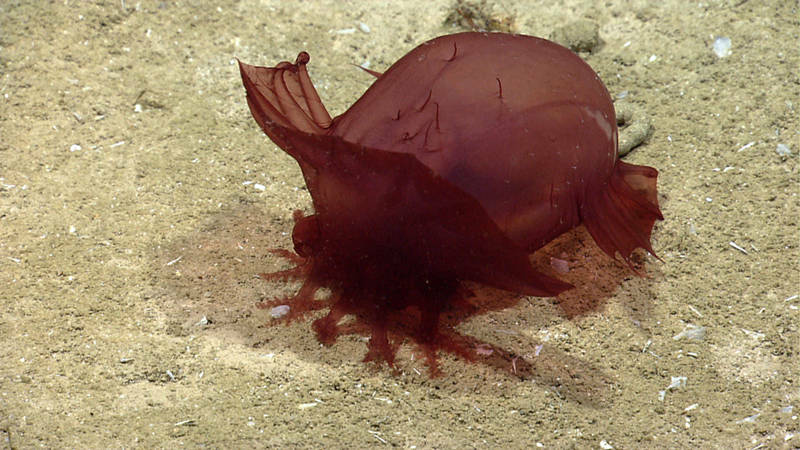 This sea cucumber uses its specialized appendages to bring nutrient-filled sediment to its mouth. Image courtesy of NOAA Office of Ocean Exploration and Research. Download larger version (jpg, 1.6 MB). 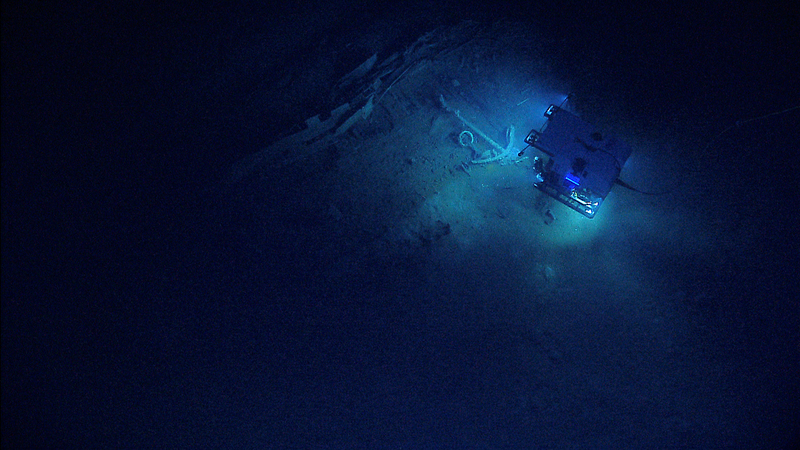 NOAA’s Seirios camera platform images the ROV Deep Discoverer shining its lights on the stern section of Monterrey wreck site B. The shipwreck contains a great deal of organic material and the hull is not copper sheathed like the other two Monterrey wreck sites. Monterrey B likely represents a merchant vessel dating to the early 19th century and carried a cargo of animal hides and large white blocks (possibly tallow rendered from animal fat). 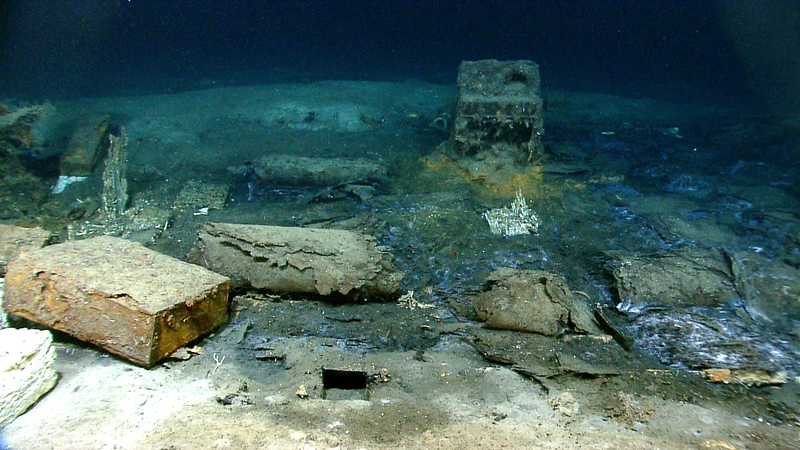 A variety of artifacts including white blocks, ceramic containers, glassware, and navigational instruments can be seen in the image. Image courtesy of NOAA Office of Ocean Exploration and Research; Extended Continental Shelf data courtesy UNH CCOM. Download larger version (jpg, 1.3 MB). Monterrey Wreck B is different than Monterrey Wrecks A and C. It contains a great deal of organic material and the hull is not copper sheathed like the other two. Monterrey B likely represents a merchant vessel dating to the early 19th century and carried a cargo of animal hides and large white blocks. The composition of these blocks is unknown, but they may be tallow rendered from animal fat. This photo shows several roles of hides and a white block on the far left. Several unopened wooden crates remain intact and the ship's stove is in the background. Image courtesy of NOAA Office of Ocean Exploration and Research. Download larger version (jpg, 1.9 MB). An unidentified jellyfish (possibly Narcomedusae?) 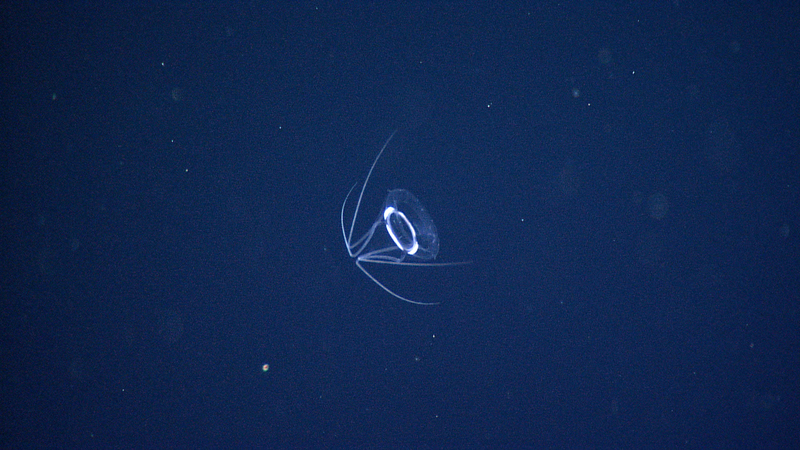 with bent tentacles was sighted during ROV surveys conducted in the water column during the cruise. Image courtesy of NOAA Office of Ocean Exploration and Research; Extended Continental Shelf data courtesy UNH CCOM. Download larger version (jpg, 1.8 MB). 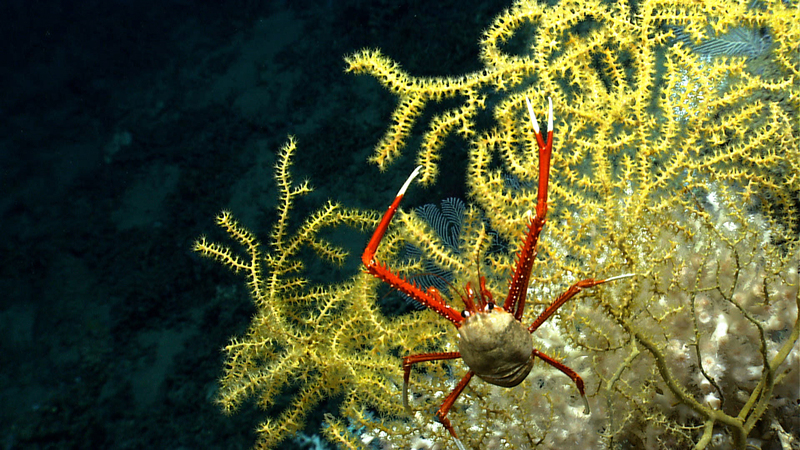 A squat lobster resides on an octorcoral. In the background you can see a colony of Lophelia, the predominant coral in this area of the West Florida Escarpment. 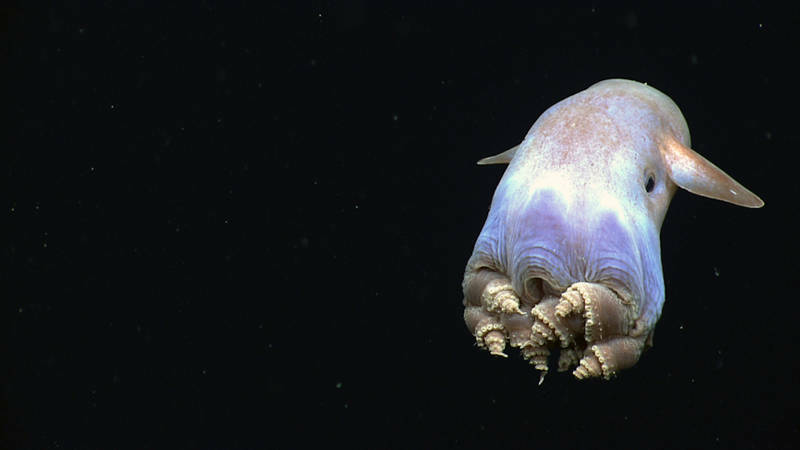 Image courtesy of NOAA Office of Ocean Exploration and Research. Download larger version (jpg, 1.6 MB). 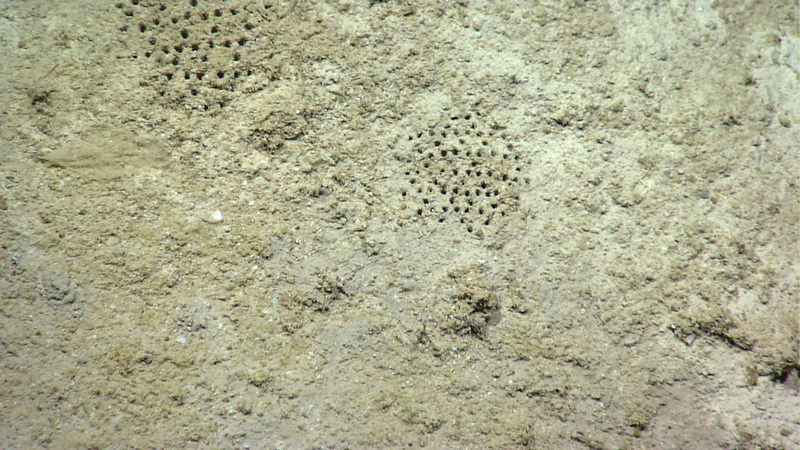 One of the highlights of our dives in the Northwest Gulf was ROV Deep Discover finding a set of Paleodictyon holes. Similar enigmatic features have been seen in the geologic record for some 600 million years and were originally discovered in the modern oceans on a part of the central North Atlantic portion of the Mid-Atlantic Ridge. Little is known about these features, and they definitely excited our science team. We are unsure if they have ever previously been documented in the Gulf of Mexico. Image courtesy of NOAA Office of Ocean Exploration and Research; Extended Continental Shelf data courtesy UNH CCOM. Download larger version (jpg, 1.6 MB). 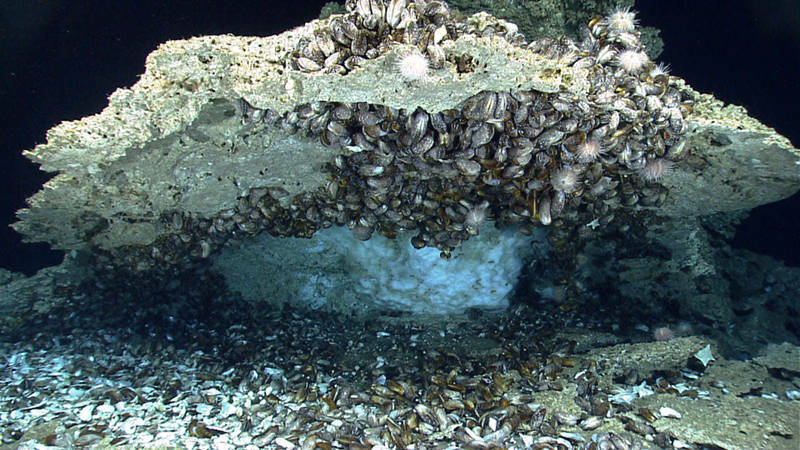 The first dive of the 2014 Gulf of Mexico Expedition had a fantastic “amphitheater of chemosynthetic life.” Here we saw bathymodiolus mussels, methane hydrate or ice, and ice worms. There were also a number of sea urchins, sea stars, and fish in this area. Most impressive was the large accumulation of hydrate mussels on the underside of the ledge. Image courtesy of NOAA Office of Ocean Exploration and Research. Download larger version (jpg, 1.8 MB). 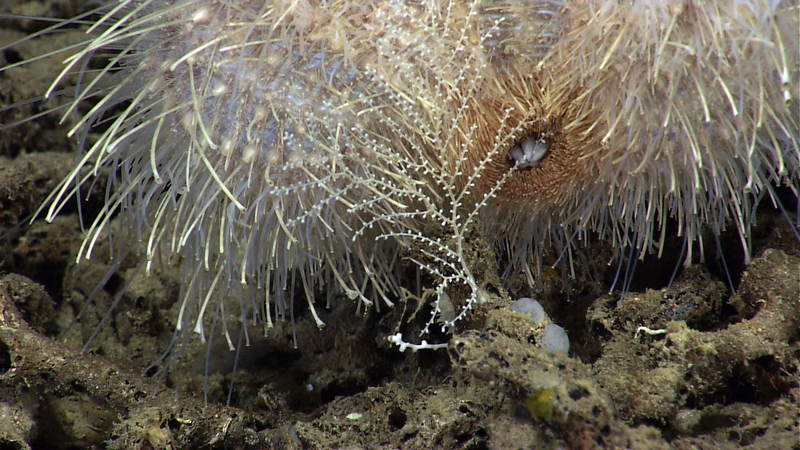 A rare instance of deep-sea predation captured on camera, a sea urchin munches on a Plumarella octocoral. This may be the first time sea urchin predation on coral was captured so close-up using high-definition cameras thanks to the incredible image capabilities of the Deep Discoverer ROV. Image courtesy of NOAA Office of Ocean Exploration and Research; Extended Continental Shelf data courtesy UNH CCOM. Download larger version (jpg, 1.6 MB). 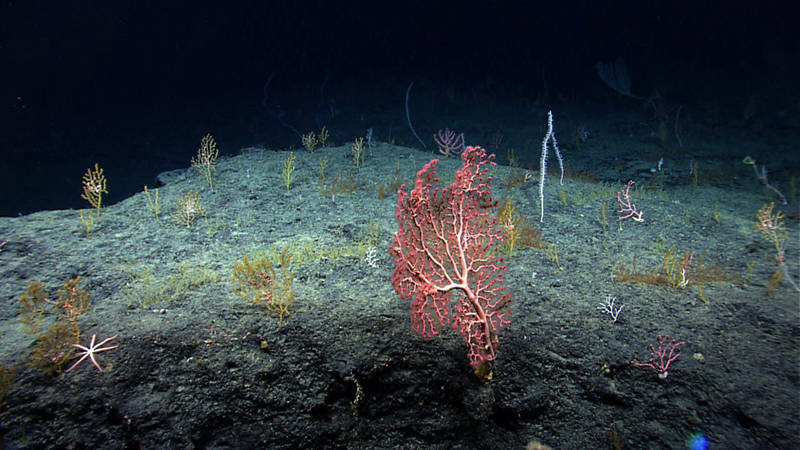 The deepwater environment of the Florida Escarpment proved to be a good habitat for diverse deepwater coral communities. In this image alone, there are four different species of corals, including bubblegum and bamboo corals. Image courtesy of NOAA Office of Ocean Exploration and Research. Download larger version (jpg, 1.5 MB). 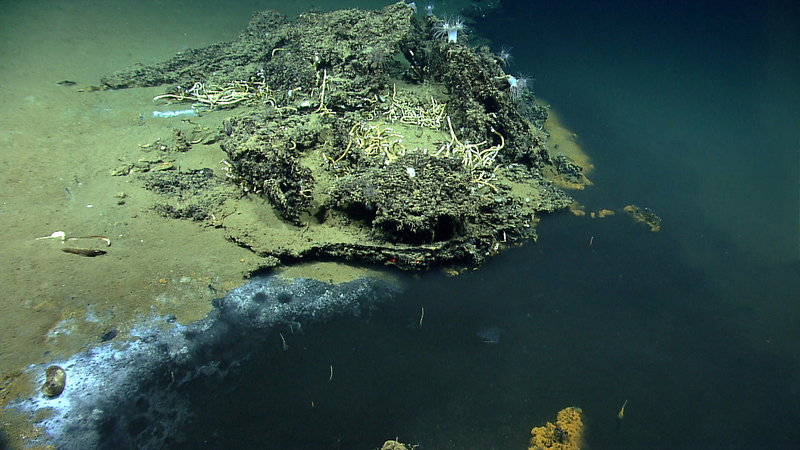 On Dive 02 of the 2014 Gulf of Mexico Expedition, ROV Deep Discoverer found an interesting brine pool. Brine seeps are common in the Gulf of Mexico, but brine pools of this size (up to 10 meters wide and ~100 meters long) are not common. They are caused by seepage from salt bodies below the surface sediments and often are associated with hydrocarbon seeps. Around the shores of this brine pool we found anemones, fish, corals, sea stars, crustaceans, and tube worms. Pictured here are tube worms and anemones on a carbonate outcrop next to the brine pool. Image courtesy of NOAA Office of Ocean Exploration and Research; Extended Continental Shelf data courtesy UNH CCOM. Download larger version (jpg, 1.8 MB). On a shipwreck, even the smallest detail helps archaeologists assemble the story of a ship’s history. Here you can see what appears to be a syringe in the top center and an overturned bowl on the right. In the center of the image you can see a piece of ceramic with a blue transfer decoration. Decorated ceramics often have diagnostic features that can provide information on their origin and cultural affiliation that in-turn provide information about the people on board the ship and places it may have visited. 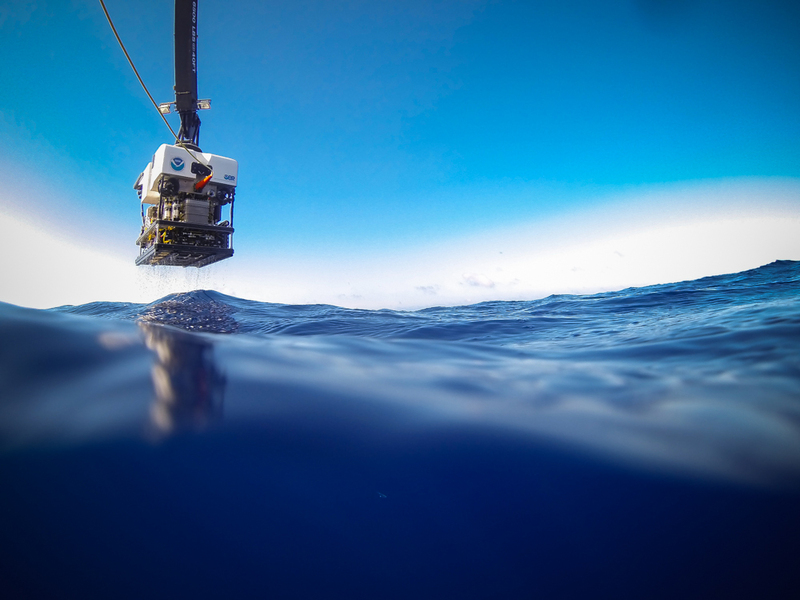 The biologists on the team are interested in characterizing the fauna that colonizes the shipwrecks. Image courtesy of NOAA Office of Ocean Exploration and Research. Download larger version (jpg, 1.7 MB). 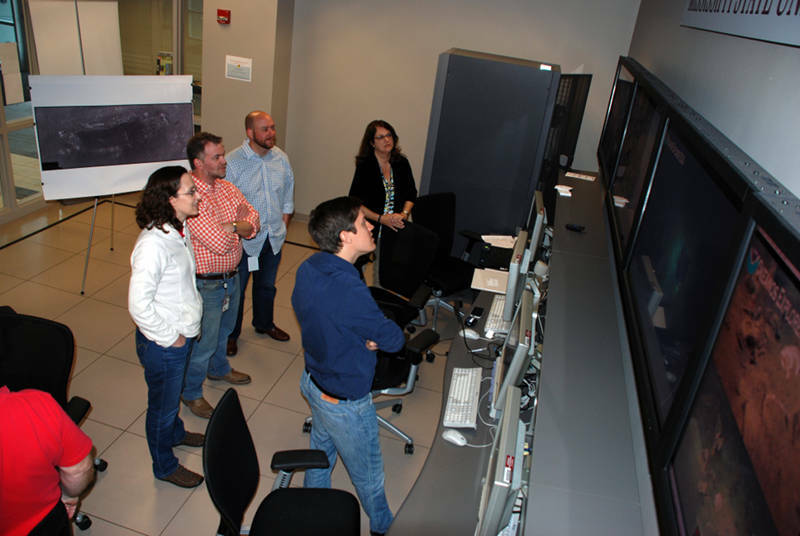 Archaeologists from the Bureau of Ocean Energy Management and University of West Florida participate from the Exploration Command Center at Stennis Space Center. Image courtesy of the NOAA Office of Ocean Exploration and Research, Exploration of the Gulf of Mexico 2014. Download larger version (jpg, 4.8 MB).